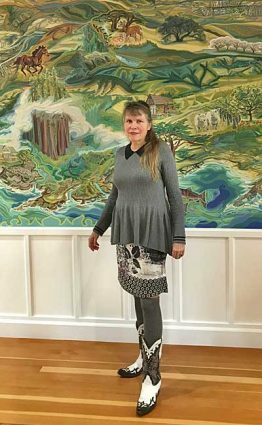 On January 19th, Mendocino County Art Association’s lecture series, “Meet the Artist”, featured Lauren Sinnott, the muralist selected for the huge outdoor mural, currently in progress, outdoors at the Convention Center in Ukiah. 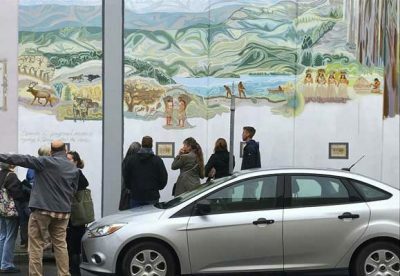 It took an enormous grass-roots fundraising effort, augmented by skillful grant writing, community input, and creation of Ukiah’s public arts policy before Lauren’s application could even be considered. 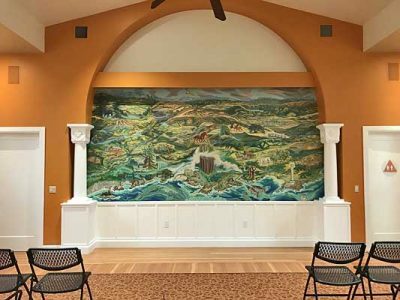 According to MCAA member Svetlana Artemoff, Sinnott provided a wonderful journey through her early life, education, artistic influences and talents before explaining the laborious effort involved in putting together a proposal for a project of this size. After exhaustive historical research, her completed written application and sketches were submitted with detailed explanations how her vision would embody the concepts required by the committee. After being selected, she had to expand her submission to included more detailed/colored panels for final approval. 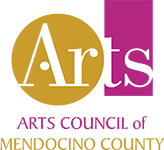 Our sincere thanks to the Community Foundation for providing space for this lecture, Laura Fogg and Alyssum Weir for the introductions and most importantly, to Lauren Sinnott for giving us this special glimpse into the life and heart of a talented and exuberant painter.